Thanks to those of you who have bought cans, looking forward to hearing the feedback. We will leave this offer open for a little bit longer and likly close it next week. Heres a chance to grab a great can at an excellent price guys. Ive been running one on a 7.62x39 M16 recently. I really like the performance of the 7.62x39. Weekly Bump for anyone interested in trying out a new can. As much as the 300BLK? They are 2 different animals, the 300 is pretty awesome with a lot of "giggle factor", the X39 stuff is just Wolf type ammo that is fun to shot. I'm going to leave this sale open until midnight tomorrow (4/20/13). Thanks to everyone who has bought 1 so far. F3s came back on some of the cans last week, some of you should be seeing cans at your SOTs shortly. what's that monocore ? ? ? Sorry I missed your post, the Monocore is something they worked up in house and refined on site. I did some sound metering this past weekend with Cory at Lane, 223 can was providing some good numbers 32-34 db reductions. Funny -- I saw that picture and my first thoughts were, "that doesn't look like my core... 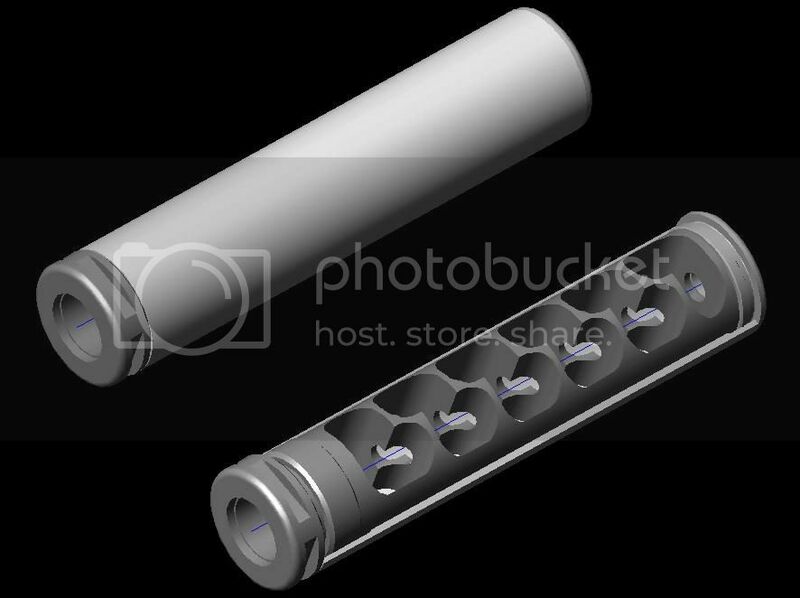 I wonder why they changed it..."
There is some similarity, like many suppressor there are shapes / designs of baffle that multiple companies use with their own twist on things. , notice the picture of the CAD file lacks the hoods over the bore that the Lanes have and show a set of baffles all evenly spaced where the Lanes "baffles" are not. I do know Lane did multiple patten searches everything was "a-ok". Interesting pic though boogyman, do you have a Paten #? Last edited by MrM4; 02-10-2014 at 10:22 AM. Innovative Arms will be contacting you shortly. I'm going to go tattle on all the cans that use K-baffles to all the other companies that do too, brb. The goal of the patent system is for disclosure and to promote innovation to improve on existing designs. ergo, if you patent a product a lot of other products will show up with minute differences since you essentially publish your entire design. Probably just to give him the patent number. A paten # would be cool, I'd like to see what they did. I talked with many manufactures over the years about the subject and a fair number of them see little need for patens because a few small changes to a design is enough to keep it from infringing on prior patens. I am no expert on patens, that is just want I have been told. Boogyman are you with Innovation Arms? Or do you know them? I have not heard of them until you posted the picture.